And title reveal, too, I guess! You can probably see why I’ve been keeping this title pretty close, but since it’s time to show off the cover, here goes! Wait–so does that mean the series is over? I mean, Elisha Rex and all that? No, indeed. I am currently drafting the fifth, and final volume, which you, dear reader, must wait until 2017 to read–sorry! But I promise, it will be worth the wait. 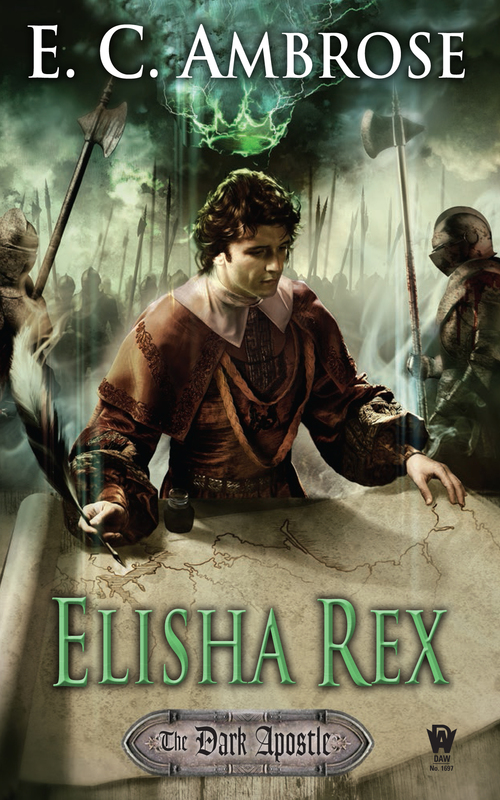 In the meantime, you can pre-order Elisha Rex, and have it show up on your doorstep (or on your device) on Launch day, July 7th! This entry was posted in books, Elisha Rex, fantasy, fiction, historical medicine, history, medieval, The Dark Apostle and tagged book launch, cover reveal, Dark Apostle, E. C. Ambrose, Elisha Rex, fantasy novel, fantasy novel 2015, medieval fantasy, new fantasy. Bookmark the permalink. 3 Responses to Cover Reveal: Elisha Rex! July 7th is a fantastic launch day. Thanks for reading! I should get you on as a guest blogger. . .